During my childhood, almost everyone's grandmother did needlework of some type. Every home had crocheted tablecloths, embroidered pillow cases, crewel-stitched cushions or appliqued bedcovers. It seemed so commonplace then but as I grew older I saw my own generation drifting away from the time-consuming arts and opting for "store-bought" utilitarian items. 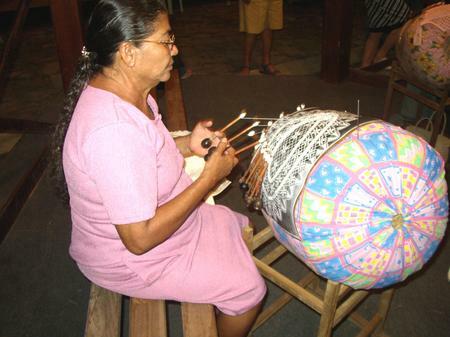 To see such art pieces in the U.S today one must go to County Fairs, antique stores or specialty needlecraft shops but in the Northeastern part of Brazil, these needlework fairs and bazaars are abundant. The Northeast area is the poorest part of Brazil so many of the people turn to handcrafts or service jobs to support their families and both types of work are respected and encouraged by the population at large. A few nights before we left Brazil, we went to a town fair which featured all manner of needle art including hand-sewn clothing, hand-made hammocks with needlework embellishments and other handcrafted items. 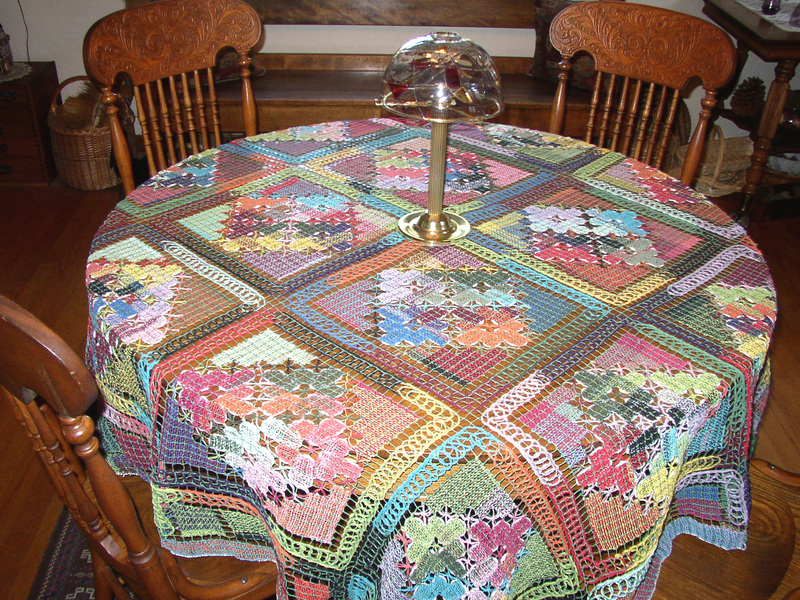 I hadn't planned to buy anything as I am already a bona fide clutterbug, but I fell in love with the colorful tablecloth in the photo below and bought it for me and table runners of different designs for my two sons and their wives. We have inherited some lovely pieces of early 20th century furniture from family and I love buying doilies and other furniture accents to enjoy for myself--and to reward and encourage needlework artists. Needle work is my hobby too, which brings me a good income in my retirement. the table cloth is gorgeous! What a gorgeous tablecloth! Did you buy it, by any chance? Yes, needlework played a huge role in my childhood and my mom's, her mom's, etc. Think there is a resurgence--at least of quilting. My mom tatted.